Role of a PeopleSoft consultant has changed over the years. Not only you have to be an expert in at least one area, but you must also be familiar with other PeopleSoft skills. I know many PeopleSoft consultants getting laid off because they couldn’t adapt to the changing technology. I’ve compiled a list of 7 things which I believe every PeopleSoft consultant should know for successful career in PeopleSoft. When you drive a car, you understand how it operates – it has 4 wheels, engine, steering etc.. You don’t need to learn how several other hundred things work together, just an overall idea is enough. Same thing applies to PeopleSoft. Whether you’re an end user, functional. developer, dba, psadmin or a manager you need to have at least a basic understanding of PeopleSoft Architecture. For e.g. Every PeopleSoft consultant should learn how PeopleSoft works and how different layers such as database server, application server, web server and process scheduler integrate together to keep PeopleSoft application up and running. Here is a video to help you learn about How PeopleSoft works. What is PeopleSoft Connect ID? Anyone who provides support for PeopleSoft application should be familiar with PeopleSoft development. PeopleSoft developers use this development tool extensively and PeopleSoft administrators also use application designer to perform some day to day tasks. Some end users use Application designer to access 2-tier PS Query tool to run queries in PeopleSoft application. What is a field, record, page, component? How to register a component? You should be able to answer these questions. Watch below video to get an overview of PeopleSoft Application Designer. With ever changing world, new features are introduced every few months. Whether it’s yearly launch of a new iPhone or periodic update to PeopleTools and PeopleSoft applications, change is inevitable. At some point, you may have participated in a PeopleTools Upgrade or Application upgrade. Whether you played an active role in upgrade process or were an end user testing the upgraded application, this process can be really long and overwhelming if you’re not ready for it. If your organization haven’t done any upgrade yet, you would want to get yourself familiar with upgrade methodology as upgrade will happen sooner or later. Also when team members understand the upgrade methodology it reduces the time spend educating the team and improves productivity which in turn saves money and time. Here are few blogs post you can read to get familiar with upgrade. Are you on a PeopleSoft 9.2 application? If your answer to above question is YES then you must understand PUM. PUM is the new and the ONLY maintenance process for PeopleSoft 9.2 applications. PeopleSoft Update Manager has become the new model that organizations all over the globe have started to use for their 9.2 applications. If you know and understand PUM, you surely have an advantage over others who are still stuck in old version of PeopleSoft application. PUM pretty much can be used by all PeopleSoft users. That’s why it is essential to grasp PUM concepts. What is PeopleSoft Update Manager? 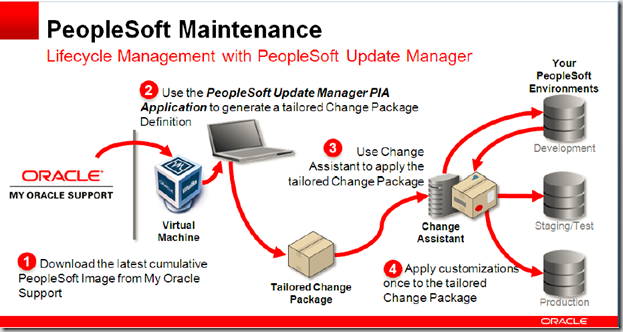 Benefits of PeopleSoft Update Manager? Everything is mobile responsive these days. Website behaves differently when opened on a computer as compared to when viewed on a phone or tablet. Layout and content of the application changes based on the device type, size and even orientation. This behavior is known as responsive web design or Fluid. PeopleSoft has also gone Fluid and now PeopleSoft application pages can be made Fluid i.e display content based on device type it’s being accessed from. Watch this video to learn What is PeopleSoft Fluid User Interface. If you’re interested in Fluid training, check this out. PeopleSoft application stores huge amount of data that can be accessed via different navigation in PeopleSoft application. When you need to access data quite frequently, using PeopleSoft online navigation is not always an efficient way. You might have to run reports via process scheduler. I find that if you know how to fetch information from underlying tables, it becomes very useful skillset. In PeopleSoft you can access table data either using SQL or PS Query. Learning SQL is a skill that will help you even if you switch to a different application. Nowadays it’s expected that every person working in IT field know SQL. If you find yourself struggling with SQL, you may want to use PS Query which is a much easier tool and can be used right inside PeopleSoft application. PeopleSoft security is not just for security administrators to learn, even functional and technical users should understand this. Basic PeopleSoft security includes learning about user profiles, roles , permission list. Of course if your job requires you to access PeopleSoft security information, you must have a command on this topic. Check out PeopleSoft Security Training. These are 7 skills which I believe every PeopleSoft consultant should have. There are definitely more skills that PeopleSoft consultant are required to possess but if you’ve acquired above, you can surely learn other skills quickly. Let me know in the comment box below, what are the other skills you think every PeopleSoft consultant should have.